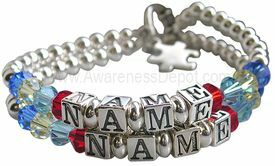 Autism Custom Bracelet Style 6: (2 names 2 strands). This option takes our smoother Style 4 bracelet to the next level - combining two strands on one bracelet with room for two separate names. This bracelet is made from .925 sterling silver right down to the wire and jump ring. It has 5mm sterling silver balls, 6mm sterling silver spacers, 5.6mm sterling silver letter blocks and 6mm genuine bicone Swarovski crystals. Custom bracelets sizes are available 6" to 8 1/2". Please note standard bracelet size is 7 1/2". You can use up to 10 letters per strand for names. Just put your letters and desired bracelet size in the comment section which is located at the CHECKOUT page. Kindly allow a few extra days for custom bracelets.